A number of Chinese brands have tried making a splash in the US and UK from Lenovo to OnePlus. While it would be great to see Xiaomi finally offer its smartphones and tablets in the West, the saying “If it ain’t broke, don’t fix it” comes to mind. Huawei, on the other hand, has already broken out of its shell by launching an online store last June, and selling the Ascend Mate 2 to customers in the US. Now, Huawei (pronounced WAH-WAY) is back with the flagship P8, and what we’ll be covering in this review, its sibling: the P8 Lite. The P8 Lite has a 5-inch, 720p IPS display, giving it a pixel density of 294 ppi. It’s powered by a 1.5 GHz octa-core processor, and 2GB RAM. A standard 16GB of internal storage is inside, and there’s microSD card support up to 32GB. At first glance, the Huawei P8 Lite looks almost identical to its flagship counterpart. However, coming in at $249 in the US and £199 in the UK, some sacrifices have been made. Gone is the metal body for a plastic faux metal frame, and the screen is slightly smaller at five inches. It’s also a bit thicker at 7.7mm, though does weigh about half an ounce less at 4.62 ounces. It’s very much a block design with ever so slightly rounded corners, and on the bottom front you have a chrome Huawei logo. On the back, the plastic continues with a brushed look. The 13MP camera and single LED flash sits in the top left corner, and another Huawei logo sits in the center below that. The P8 Lite feels a little on the thick side, but at 4.62 ounces, is very light. From the faux metal frame to brushed plastic back, every angle provides solid grip, and reassurance it won’t say hello to concrete anytime soon. If it does, Corning Gorilla Glass 3 should help minimize the damage. On the top is the headphone jack, and on the bottom is the charging port and two speakers. Well, there are two speaker grilles, but the reality is that there’s only one speaker, which is on the left-hand side. There was a time when 720p was great, but that time has long passed. The 5-inch IPS display does a good job, and offers OK color reproduction, but it clearly lacks the pop of a 1080p panel. You can’t help but notice individual pixels throughout apps. One could argue the $249 (£199) price point, but that didn’t stop Alcatel from packing a 5.5-inch 1080p display in the OneTouch Idol 3. Bezels are to be expected, but a rather thick black bezel wraps around the entire display. Tapping on the display requires a little more force than on other smartphones I’ve encountered, and I frequently found myself having to double tap for something to happen. This was particularly annoying when typing on the keyboard, and noticing the spacebar never registered after creating a blend of words. There are no two ways about it: Huawei’s EMUI skin borrows a lot from iOS. However, before we get into that, let it be known the P8 Lite is not running Android 5.0 Lollipop like it says on the company’s website. You would think so given that the navigation buttons are identical to those found in Lollipop, but you’ll actually find the phone is running Android 4.4.4 KitKat. This could just be a simple mistake by the person updating the product page. After all, it also mentions the processor clocked at 1.2 GHz. However, given there are Lollipop navigation buttons, I can’t help but feel like Huawei is trying to trick people into thinking they’re running the latest, greatest OS. Not cool. One of the first things you’ll notice with the interface is you can’t remove apps from the home screen unless you want to uninstall them. Because of this, there’s no app drawer, and you’ll have to swipe and swipe to find the app you’re looking for. Swiping down from the notifications drawer gives you more evidence of Huawei’s custom skin, and you’re met with two categories: Notifications and Shortcuts. The first is pretty self-explanatory, and what you see by default. You can swipe away individual notifications or tap on the trash can icon to remove all notifications. Shortcuts is where you’ll find quick access to settings, and the ability to adjust your screen brightness, which you will have to do manually. With auto brightness turned on, it always seemed to be stuck at 3/4 of the way. This was fine outdoors, but too bright indoors. The settings menu has all the options you’d expect with some minor changes, and extra features. “Data usage” is now “Data traffic management.” It’s laid out particularly well, and under “Traffic use ranking,” I liked being able to see how much data apps used over Wi-Fi as well. However, one major oversight is the lack of an ability to set a data warning and limit. Under “Privacy & security,” there’s “Notification center” and “Protected apps.” The notification center is where you can turn notifications on or off for specific apps, and Protected apps are apps that you allow to keep running after the screen is turned off. The Huawei P8 Lite lets you know which apps are power intensive, and gives you the option to close them in an effort to save battery. “Smart assistance” brings some unique features to the table, the first of which involving motion. For example, you can flip your phone over to mute/ignore a call, and if you decide to answer a call, once you pick up the phone, the ringtone will automatically get quieter. There’s also the ability to shake your phone to rearrange the apps on your home screen, but only a mad man would enjoy that. Just…why? “Gloves mode” actually worked really well, and “Touch-disable mode” supposedly prevents accidental taps while the phone is in your pocket or purse. For when you’re away from an outlet, and running dangerously low, Ultra power saving mode can step in. When turned on, the phone changes to a black and white layout, and only allows calls, messages or access to contacts. On the performance side, the P8 Lite worked like a champ. It’s definitely not the fastest phone out there, but apps opened quickly, and transitions and scrolling were smooth with no blatantly obvious jank. In our benchmark test, we run Geekbench three times in a row, and average out the multi-core score. 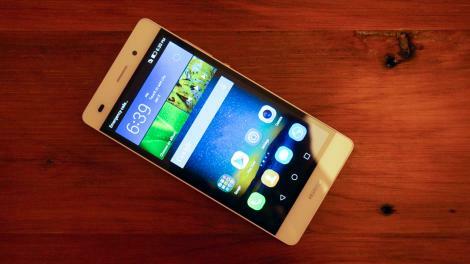 The Huawei P8 Lite averaged a score of 2,660. This is just behind the Samsung Galaxy Note 4, but nearly 600 points ahead of the Alcatel OneTouch Idol 3. As I mentioned previously, there’s only one downward facing speaker despite the appearance of two. It gets somewhat loud, but taps out at about 3/4 of the way. It’s definitely better than having a speaker on the back, however. The earpiece is almost useless, and I found it difficult to hear the other person even with the volume maxed out. In 90% of cases, I either used headphones or put them on speakerphone. The 13MP shooter on the back uses a Sony sensor, and the P8 Lite shot good photos in the right lighting conditions. As per the usual, low-light photos were noisy. It takes about two full seconds after pressing the button for photos to process. The skinned UI once again makes itself known in the stock camera app. There’s panorama, HDR, and a “Best photo” mode, which is basically burst mode, and takes several photos in quick succession. “All-focus” attempts to put the entire image in focus, and “Watermark” is pretty self-explanatory. While snapping a photo took longer than I would have liked, the camera tends to focus very fast, and you can swipe to the left to switch to video mode. One nice feature is the ability to open the camera by simply double tapping the volume button when the screen is turned off. It worked fairly quickly, taking about three seconds. While not as good as the 8MP front-facing camera on the Alcatel OneTouch Idol 3, the 5MP camera on the P8 Lite is good enough for the average person. When you switch to the front-facing camera, the camera app automatically goes into “Beauty” mode, which uses some software tricks to give you more of a glow, and smooth out your skin. Sadly, software can’t save all of us. With moderate use, I was consistently able to get around 16 hours with a little over 20% battery left. This was with around 2 hours and 30 minutes of screen-on time. However, it’s worth mentioning that I had to manually adjust the display brightness, so with auto brightness turned on, I wouldn’t expect to get the same numbers. In our battery rundown test where we loop video at 100% brightness, the Huawei P8 Lite lasted 3 hours and 35 minutes. This was an hour and 20 minutes less than the Alcatel OneTouch Idol 3, which has a much larger 2,910 mAh battery. Being able to quickly access the camera by tapping the volume button twice was a great added feature. Typically, a manufacturer’s skin over top of Android can slow a device down, but Huawei managed to keep things running relatively smoothly. Unfortunately, I found there to be more dislikes than likes with the Huawei P8 Lite. The 720p display, while okay, isn’t as good as comparable smartphones, and the fact that a new phone launched with Android KitKat is pretty disappointing. The Lollipop navigation buttons are in bad taste, and the fake speaker grille, while looks good, just adds to that feel of trickery. The UI has been overly customized, and while may suit other folks, just isn’t something I can fall in love with. However, I do have to hand it to Huawei for not letting it affect the performance too much. With the Alcatel OneTouch Idol 3 featuring a 5.5-inch 1080p display at the same price, there’s really no reason to buy the Huawei P8 Lite. Even with the performance issues of the Idol 3, the better display, dual front stereo speakers, 8MP front-facing camera and better battery life make up for it. Also, there’s the OnePlus One, which recently saw a permanent price drop to $249. However, if a 5.5-inch display is too big for you – which I’d argue to test in person first, as you may just be surprised – the BLU Life One is a very interesting contender for those in the US. At just $100 after its June 19 launch, it’ll offer a nearly identical display, rear and front camera, but takes a cut in performance and storage. All considered, the P8 Lite simply can’t keep up with the competition.